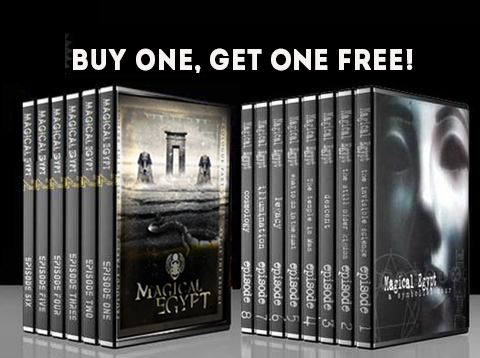 In addition to the content Magical Egypt explores, the series itself is somewhat of an enigma. Some have called in “no ordinary documentary” and in many ways that is true. Next year the first Magical Egypt Series will be 20 years old. It is filmed in standard def, (handheld footage to boot!). It’s leading researcher has passed away, it is very expensive at $129 for the 8 part series and yet it continues to be the gold standard in films about Ancient Egypt. Much of the credit for the longevity of the series goes to John Anthony West, the maverick egyptologist who eliminated for many the cognitive dissonance surrounding ancient Egypt. Finally ancient Egypt began to make sense. Both series, there is now a second season, are also compelling because they dive deep. You will not find a one liner by experts in Magical Egypt. Instead academics and authors are allowed the time to fully explain complicated ideas about ancient Egypt, alchemy, magic, hermeticism, the tantric arts, and consciousness itself. These series are not for the faint of heart, yet they have garnered high praise. Credit must also go to Chance Gardner who brought together voices like Gary Osborn, Brad Klausen, Ricard Cassaro, Rick Strassman, Lon Milo DuQuette, Robert Bauval, Aaron Cheak Phd, Mantak Chia, as well as many other authors and academics, along with his own voice to build upon the ideas propagated by West. Gardner also wrote, shot, edited and animated the series himself. It can be tough producing an esoteric series out of a bedroom in a small town in eastern Australia, especially when your mentor is gone but for Gardner there are days when it is all worth while. Yesterday was one of them. Magical Egypt was made an official selection for the First Hermetic Film Festival in Venice in 2020. Gardner wishes to thank all the participants in the show who have helped tell a such a captivating story, as well as the Kickstarter Producers, Kickstarters, and everyone who has invested in the show. The Magical Egypt Film will have its Italian Premier at the festival in Venice. Please sign below if you would like to be notified. It was a year ago today we lost our John Anthony West to cancer. How did the Ancients know how to do what they did? That question is one of the most frequently asked questions about the ancient Egyptian culture, especially when one comes to fully realise the sophistication of the accomplishment. The Great Pyramid is the most accurately aligned structure in existence and faces true north with only 3/60th of a degree of error. In the article A NEW ROSETTA STONE OF CONSCIOUSNESS FROM ANCIENT EGYPT? I explain how the development of archeology in many ways robbed the reverence for the ancients and their great feats such as the Great Pyramid in Giza, opening the door to the idea recently, that what remains we see today, were most likely the accomplishment of ancient aliens. This idea is encouraged, especially by what is left on the cutting room floor at the History Channel despite some experts insistence that aliens were not in fact responsible! I get it why they do that! In many ways the idea of ancient aliens is alluring and buzz worthy particularly in the absence of any other explanation, but the sad part is, it denies humanity a powerful legacy. Could the Ancient Egyptians have possessed an Owner’s Manual for the human mind? Magical Egypt Series Two attempts a forensic reconstruction of the Science of the Ancients through a study of Ancient Aesthetics. As part of this investigation the Magical Egypt research team discovered a hidden message that speaks in a language familiar to artists and esotericists. Did the Ancient Egyptians encode messages in their art? The Magical Egypt research team discovered a number of points of divergence between the orthodox views of mainstream egyptology, and evidence expressed by the art and architecture that are still visible in the ruins of this ancient and deeply enigmatic culture. One of them was a hidden message that speaks in a language familiar to artists and esotericists. A language that is capable of transmitting a bewildering variety of highly technical schematics and symbols. And what is the message it transmits? It is a message that the entirety of Egyptian culture was in the service of expressing. Of radiating. But always in a curiously veiled way. The message was a visual transmission of the central secret of human existence. A secret, sacred science, simultaneously hidden and radiated by the temples, reliefs and statuary. The science is equivalent in sophistication and sheer anomaly to the pyramids. It is self-verifying in many ways. Where this becomes interesting is when the ancient science is compared to modern science. While there is a great deal of similarity in the organization, categorisation and logical codification of the both sciences, there is a subtle, but perhaps all important difference in the focus of the two. The ancient science is structured around an eerily sophisticated dynamic model of consciousness, that extended to a cosmology that could explain how consciousness integrated with the visible and non-visible worlds around us. The remarkable schematisation of the mysteries of consciousness, both in their physical, biological component, and in the much more mysterious invisible twin, the mental, phenomenological experience of mind and consciousness that arises from the biological components, but who’s nature seems to be something outside of physical space. And perhaps outside of time. A New Rosetta Stone of Consciousness From Ancient Egypt? When the Rosetta stone was found during the Napoleonic era, Ancient Egypt was held in the highest regard. According to Jeremy Nadler in Shamanic Wisdom in the Pyramid Texts: The Mystical Tradition of Ancient Egypt, Ancient Egypt was seen as harbouring a tradition of deep wisdom that was the inspirational fount of Greek religion, mythology and philosophy - particularly Platonism and Hermeticism. In In 1799 this knowledge of Egypt depended on ancient commentators such as Plutarch, Diodorus, Iamblichis and Aristotle. According to Aristotle, Egypt was “the cradle of mathematics” and the priests of Egypt invented geometry, arithmetic and astronomy. Other ancient sources testified that prominent Greek thinkers like Thales, Pythagoras and Plato learned their philosophy and science from the Egyptians. It was 20 years, however, before the transliteration of the Egyptian scripts was announced by Jean-François Champollion in Paris in 1822, and with that Egyptology was born with early Egyptologists like Champollion, de Rougé, and Brugsch holding a great reverence for Egypt as the source of a sublime metaphysics and theology, but this view was not to last. The opinions held of the ancient Egyptians by the Egyptological establishment were about to embark on a steady decline. By the turn of the century earlier views of Egypt were displaced by a far more critical approach as Egyptology established itself as a professional academic discipline. Egyptologists like Maspero and Erman views differed markedly from those of the earlier “romantics” who respectively described the Ancients as “ semi barbarians, and ‘compliers of spells”. To many of the first generation of scholars, the sacred literature of ancient Egypt seemed so muddled, haphazard and obscure that any residual hopes of rediscovering some “forgotten wisdom” or “secret knowledge” came to seem a foolish endeavour. Thus it was concluded that the ancient Egyptian mind was “pre philosophical”, incapable of coherent or systematic thought and given to expressing itself in rather crude imagery. This view of the ancient Egyptian mind to a large extent remained the dominant one among Egyptogists for much of the twentieth century. That Egyptians, far from being the guardians of a secret wisdom, were actually an ignorant lot who had not yet discovered philosophy or science. As Egyptologist B. L. Goff wrote in the late 1970’s, “In ancient Egypt, as also elsewhere in the ancient world, there was no knowledge of consistent laws governing the operation of everything around us”. This assumption had such a strong hold that even when the historian of science Otto Neugebauer and the Egyptologist J.-Ph.Lauer were forced by the evidence on the ground to admit that the Egyptians were using pi and phi in the construction of their temples, instead of concluding that the Egyptians had a theoretical knowledge of these mathematical relations, they put it down merely to “practical knacks” and “utilitarian empiricism.” In other words, they used pi and phi without being aware of the fact they were doing so. A growing rift thus emerged between “mainstream” Egyptology, and “outsiders” who usually did not have a formal qualification in Egyptology and so could easily be dismissed as cranks. Foremost among the latter was R.A. Schwaller de Lubicz, who despite his detailed study of the theoretical principles and practical applications of ancient Egyptian mathematics in The Temple Of Man remained virtually ignored by the Egyptological establishment. In fact when The Temple in Man ( Le Temple de l’Homme) first appeared in French in 1957, the eminent Egyptologist Etienne Drioton counselled his colleagues to "build a common wall of silence" around it lest it find its way out into public view. With just a few notable exceptions, that injunction was obeyed within Egyptology itself. Serpent in the Sky presented a now revolutionary, exhaustively docu­mented re­interpretation of the civilisation of ancient Egypt. West showed that Egyptian science, medicine, mathematics and astronomy were all of an exponentially higher order of refinement and sophistication than modern scholars will acknowledge. Ultimately it was West’s book that inspired and comprised a significant portion of the Magical Egypt documentary series that would spread this knowledge about ancient Egypt even further into the modern world, and might have surprisingly lead to the discovery of a new Rosetta Stone. In 1998 while animating a sequence for the Magical Egypt Series award winning animator Chance Gardner was stuck by the number of correspondences revealed by the overlay of the classic Egyptian Pylon over the human skull. A hidden language was discovered that spoke through an ingenious use of geometric correspondence. At that time Gardner was not certain what the ramifications of this finding would be, but an idea began to gestate in the back of his mind. At around the same time Author Gary Osborn also noticed a number of correspondences between certain instances of ancient Egyptian art, and brain anatomy as a result of having undertaken a study of esoteric literature in order to come to terms with a mystical experience he had had. One example of Gary’s discovery quickly became an internet meme as we shall see below. What Gardner and Osborn did not realise at that time is that both, in their own way had stumbled across a method of interpreting encoded meaning in the art of the Egyptians, possibly as powerful as the Rosetta Stone had been at solving the riddle of hieroglyphics language. As mentioned above, Gardner’s first discovery involves the classic Egyptian temple pylon facade overlaid upon the human skull and brain, and much like the actual Rosetta Stone it also took him almost 20 years to translate its meaning. Geometrically the pylon is two symmetrical, mirrored shapes, connected by bridging architecture. The pylon doubles as a remarkably detailed and instructive schematic that not only shows the structure of the human brain, but teaches important information about its "optimal configuration". The architectural connection between the hemispheres serves as the "door" into the “temple”. And at the exact place that corresponds to the esoteric "third eye", a special emphasis is placed. The winged disk. The iconic winged disk is itself a schematic of sorts, describing an emergent property that occurs through a union of the polarities of consciousness. The inner top corners of the temple correspond exactly with the major brain fissures on either side of the motor cortex. The architecture perfectly frames other important brain systems; notice how the vertical door blocks perfectly frame the olfactory nerves. Osborn’s important discovery involves an unsuspected schematic hidden in one of the most famous icons from ancient Egypt. The Eye of Horus also reveals itself to be another ingenious schematic of a very important nexus between biology and consciousness. The corpus callosum, seen from the side, is perfectly schematized, with special emphasis placed on correspondences with the brain centres that make up the third eye. The pineal, thalamus and pituitary complex. Research team member and career illustrator Brad Klausen discovered an example of correspondence that reveals yet another hidden schematic. One that has been in full view of all, but has resisted discovery for all these millennia. This schematic is embedded in the morphology of the ram sphinxes that line the entrance to Karnak temple. The unusual placement of the pharaoh beneath the chin of the ram, coupled with the prominent lines of the rams nose, caused an inductive leap for Klausen, and in a flash of insight he made two discoveries for the price of one. One discovery was big. The other bigger. The more one understands about the biology and function of the individual hemispheres, the more the symbolism bears out. One can see the schematic contained in their dynamic relationship as eternally paired enemies, with seemingly inverse objectives. This powerful image also conveys the importance of occupying a powerful stance of control between the two inverse "forces" we all have in our heads. This statue and its associated mythology create an impressively insightful schematic. One that not only imparts understanding of one component of consciousness, as embodied in an individual god, but also shows the role it plays in the overall operations of consciousness. In other words, first it shows you what it is (form), then it tells you what it does (function). Seen in this sense, Horus and Set act as a remarkably accurate model to schematise one of the biggest structural and functional features in human consciousness: the division of a single brain into two distinctly separate hemispheres. This physical scission is mirrored in the operation of the brain, and effects our consciousness in such a fundamental way that it very much defines who we are. The two hemispheres are not only structurally different, but they operate very differently. The left hemisphere is best suited to a micro-focus, operates in language, is literal and linear, list oriented, and is hierarchical. It deals with issues of past and present. It craves rules and operates best when a pre-determined sequence of responses is required. It often attempts to usurp the decision making role of the right brain and often lies to itself. The right brain is literally the opposite. It is non-linear, uses webs of association, speaks in symbols and geometric relationships, rather than linear language. It is responsible for the recognition of beauty and meaningfulness, and appreciation of the "big picture". It is the centre that produces ideas or images from nothing, the creative spark. The right brain is a notorious disregarder of rules. It has no regard for time, and it's awareness is only of the eternal NOW. While the left hemisphere is concerned with accumulating facts and sorting them in hierarchical order, the right brain is the domain of associations and context - of meaningfulness. This makes it the polarity of understanding. Of perceiving the underlaying meaning behind and between things. This ability to create geometric thought structures means literally the difference between opinion and fact. Between guessing and knowing. Between a random cloud of opinions and a rational, well constructed "thought form". From the schematic presented by Horus and Set, we also learn the optimal configuration of this relationship. Horus, the rightful ruler, the ever vigilant guardian against the encroachment of evil, physicality, our animal nature. Avenger of the killing of his father Osiris. When Horus is triumphant, the emergent property is enabled. Research is ongoing, and it is yet to be determined how detailed and how far the correspondences go but from this organised study of correspondences within the ancient art, Gardner, Osborn, and Klausen found ample evidence to demonstrate the existence of a previously unrecognised science in place in the ancient world, albeit one with a very different focus than ours today. In 1979, harkening back to the classical opinion of Ancient Egypt West concluded that the whole of Egyptian civilisation was based upon a complete and precise understanding of universal laws, and this profound understanding manifested itself in a consistent, coherent and inter­related system that fused science, art and religion into a single organic unity. Now Gardner, Osborn, and Klausen corroborate and expand West’s research by demonstrating that the art, statuary and architecture, and in fact the entire cultural aesthetic of the ancient Egyptians was in service of transmitting a scientific message. One that employs an ingenious visual language of correspondence as a method of “schematizing” both the biological systems that result in the experience of consciousness, and perhaps even more astonishingly, the architecture of consciousness itself. Since at the current time, modern science cannot arrive at a consensus about what human consciousness even is, the discovery of this ancient message and this ancient corpus of consciousness-centric science may be something akin to the discovery of the long lost Owner’s Manual for the human mind. The series of findings are documented in the Magical Egypt Series 2. As the series progresses, these initial discoveries lead to stranger and even more significant discoveries. What a journey it has been : ) We have had computers blow up, imposters and frauds, and now cancer to contend with...but finally..... the end is in sight. I cannot tell you how happy I am personally to be writing this as I assure you it has been harder on me than it has on you : ) That being said I am amazed daily by the generosity, kindness, patients and love you have shown Chance and I through all of this...I truly feel blessed by you ! You see, just as engineers "unpacked the pyramids" to find all kinds of astounding miracles...our "arty" boys..and in particular Chance, Gary Osborn, Brad Klauson, William John Meegan, Richard Cassaro and Robert Lawlor have "unpacked" the art, and in so doing have found astonishing things....so much so we have had to bring in occultists, alchemists, and scientists just to make sure we weren't crazy! Art is the expression of the state of consciousness of a culture. Shifts in the mode of art are often the harbinger of a societies collective consciousness. Studying an ancient culture through aesthetics reveals things that about a culture that are often not discernible through forensic analysis. Where Science fears to tread and Religion forbids us to look the Artist takes over as the rightful tour guide and what we find is strange. The Truth is Strange. JAW and Hancock Live in NYC! Graham has kindly released the video of the talk that John and Graham had in New York in order to raise funds for JAW's fight agains cancer....Thank you Graham : ) You can watch this video at the link below. If you have not heard John in now on his way to Houston to start his war on cancer...so please support him. I think making a documentary is very much like having a baby. Once you have that bundle of joy in your hands you forget how hard and painful it was birthing it.. and even though you vow you will never do it again, you do forget and do it again. Well I think we had fully remembered how hard it is, how much blood sweat, tears and time it does take, especially when it is just one man doing the writing, shooting, editing, score and animation, and so my other purpose in writing you today is to share with you that we are running a little late on the delivery of the new shows. We've had some late-breaking opportunities arise, including unexpected last-minute guests who have brought important, and in some cases paradigm shifting discoveries to the show. It has added a fantastic new depth and a vastly greater historical significance to the show, and it has made it necessary to expand the first episode to 90 minutes. These last-minute developments have added production time, and so we have decided to push the release date a little. As the god parents of this child we hope you will understand. We do apologize for any inconvenience, but we tuly believe that the expanded episode will be worth the trouble. There are some big things brewing here, and because you can only let Pandora out of the box once, it is important to do it properly. Additionally Chance is outdoing himself completing some ambitious animations that are going to be the icing on the cake. It will be worth waiting for. Much love to you and Happy Holidays! There is a door inside your head. There is a door in your head that no one told you about. It is the door through which we enter into life. And out of life again. The subject of the ancient world and human historical timeline are contentious at best, with many vested interests and cultural cross-currents arguing over fundamentally different "Models" of human development. In one model, which is the standard, orthodox view, humans have developed in a linear progression from primitive and savage beginnings to the modern day, which in this model, is the "smartest" and most technologically accomplished that people have ever been. Back by popular demand: the underground classic documentary series "Magical Egypt" returns after 15 years for a long-awaited new run of episodes. The iconic host and writing team behind the original series are back, joined by a new generation of researchers, scientists and thinkers that represent "The New Counterculture".